Hosting a party or event can be stressful unless you know you have the right kind of covering no matter what curve ball the weather throws at you. This high peak tent is extremely safe even in rigorous weather conditions. The heavy-duty 15 oz. 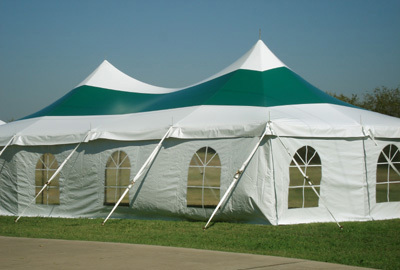 "Block Out" top will keep you and your guests shielded from the rain and wind. The 2" seatbelt ratchet straps and reinforcement make this very secure if properly installed. The triple re-enforced stress points and the custom high peak engineering are just some of the things that make this tent of the highest quality.